Home Blog What Is the Typical French Home Like? What Is the Typical French Home Like? Before you begin working your way to foreign language fluency, it helps to understand the culture behind the language you’re learning. After all, language exists to help a group of people express their ideas and beliefs. France is an old country with a rich history and culture. As you begin your French language program, gaining a strong grasp on this history, the values, and the etiquette will help you rapidly achieve success. In particular, French housing is very different from U.S. housing in a lot of ways. The French have a view of the importance of privacy in the home that is much different than in America. While Americans sense of privacy does include keeping strangers at a distance, that gap is noticeably shorter than in France. This is not apparent until you compare property design and landscaping. French author Raymonde Carroll wrote about Americans who were “living on the street.” At first glance, this reads as if she was referring to the homeless problem in America. Carroll was directing her commentary at the widely adopted style of American homes being built with the front of the house close to and facing the street. Many American homes provide little privacy for their occupants. This is not a major concern for many of these families. These homes do not have privacy from either landscaping or curtains in the front windows. Most do not have fences or any sort of barrier between the street and the front door. French homes are often enclosed by walls, fences, or hedges, regardless of whether they are in or outside of towns. Curtains that may be open during daylight hours are closed at night. The French typically desire to keep their family life private from their activities outside of the home. This contrast between the French and Americans does not reflect on warmth or openness of the people of each country. It’s more of the French believing that everything has its place and the home is more private and generally for family. Before buying or renting a home in France, it is necessary to understand a few important differences in the process. What constitutes an unfurnished home is a major difference from the American idea of unfurnished. In addition to not having appliances, French houses are leased or sold with no fixtures. This includes everything from light fixtures to holders for toilet paper. When inspecting a home, being able to measure the cutouts in a property is very important. Your real estate agent should be able to assist you in where to find appliances that will fit in your new home. Having the right measurements and knowing what will fit, before you sign a contract, will make it much easier to furnish the house. Some houses in France have bathrooms that do not contain a toilet. Most bathrooms will contain a bidet. Bidets are used by women to clean their intimate area. Bidets are often seen in films and TV accompanied by jokes about what they are used for. In the film Crocodile Dundee, Paul Hogan seemed confused about the purpose of a bidet. Fortunately for him, his co-star, Linda Koslowski, explained its functiond to him. Another bathroom item that might be confusing for people visiting France, is “le lavabo turque.”7 This is a hole in the floor of the bathroom and can be found in some rest stops and older structures throughout the country. The hole has small platforms, for your feet, which allows you to either stand or squat while taking care of business. Naturally, whenever you are on holiday or traveling for any reason, a restroom will eventually become necessary. In France, restrooms typically carry the signs “toilettes” or “WC.” Women’s and men’s restrooms are usually indicated by a picture. Every so often they will simply carry the letters “H” or “F,” which stand for “hommes” and “femmes”, respectively. The more traditional signs for toilets have the sign “D” for “dames,” and “M” for “messieurs.” In some areas, public restrooms are available, but you are better served by visiting a café or similar establishment to use its toilet. Of course, you should at least leave a small tip or order a beverage, as opposed to simply using the restroom and leaving. A common dream among the French people is to own a house and garden built to custom specifications. This can be a difficult goal to attain in towns and large cities. Local zoning ordinances restrict the types of material and building styles that may be used. Those who want to fulfill their dream of having a custom home often have to look outside of the large population centers. Most people living outside of cities discover a welcoming environment that encourages creativity when it comes to home construction. They will find many different styles of home to choose from out in the countryside. The ability to use colors and materials that suit individual tastes in design is one of many appealing factors of having a second home. Many French citizens own or rent a primary residence in town while maintaining a second home in a rural area. Some have purchased these properties while others have inherited homes passed down by their family. Being close to family and their roots is a motivating factor in deciding on a second home location. Recently, there have been growing numbers of French citizens who have made the decision to give up the country life and have moved to towns and large cities. The result of this has been that a large number of cottages and homes have become available in more rural areas of the country. Many of these properties are listed at reasonable prices. 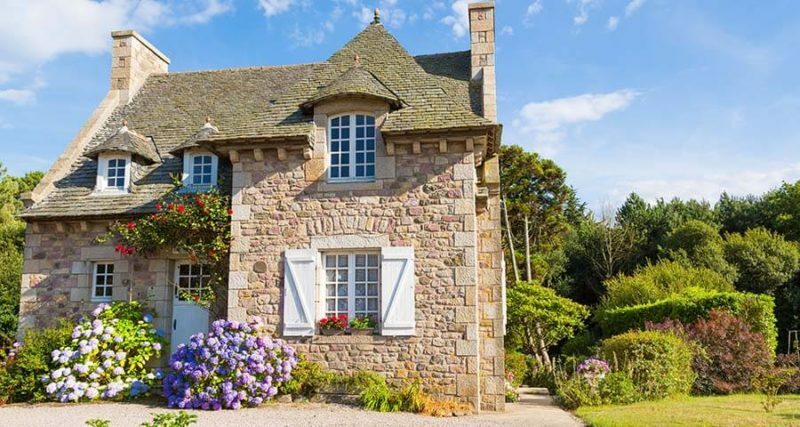 Both French nationals and foreigners looking for second homes are finding a buyer’s market throughout many regions of France. Most homes in France, whether in a town or a city, are rented apartments. French streets are embellished with rows of four or five story buildings with large doors made of wood or metal appearing periodically. These doors take you to the courtyard where you can then take the elevator or stairs to the apartments. Before technological innovations, there was the “concierge,” or caretaker, a mythical and legendary figure of French culture and literature. She was usually a woman living on the ground floor and would take care of the grounds and assist with contacting the residents. She was the guardian and kept a close eye on all that came and went from the building. Today, the intercommunication button connects you to the apartments. Just state your name or provide a code, and the carriage entrance, or “porte cochère,” will open. Remember the code, or prepare to wait! A building’s public interior may not look as affluent as the interior apartments. For instance, since electricity is pricey in France, you may be climbing the stairs as the lights go out. Keep looking straight ahead so that you can locate the light switches! Kitchens are private and surprisingly small for a nation enamored with food. Wandering into your host’s kitchen to continue a conversation is not permitted in France.